Германия: "Влияние США на немцев сокращается"
Шойбле Вольфганг, министр финансов Германии: "Мы, конечно, должны показать, что Германия часть Запада", - в ответ на то, что есть признаки, что немцы не полностью поддерживают альянс с Западом, - "но было бы еще лучше, если США поймет, что и США также часть Запада", отметив, что большинство немцев хочет стать посредником между Россией и Западом, а не переходить полностью в западный лагерь. Он заявил, что это отражает падающее влияние США в Германии, что является в том числе следствием нежелания США ратифицировать международные соглашения - такие как реформа МВФ. "Элиты США должны задать себе вопрос - почему "мягкая сила" США не столь значима в глазах тупых немцев"? BERLIN—German Finance Minister Wolfgang Schäuble said his country is prepared to raise pressure on Russia to help stabilize Ukraine, sending a signal on the eve of Ukraine's presidential election that Europe's leading economic power isn't shy about confronting Moscow. "We want good, partner-like relations," Mr. Schäuble said in an interview. But he warned: "If Russia does not follow the rules, then we won't seek military escalation, but we will of course use our political and diplomatic abilities to increase the pressure on it to abide by the rules." The veteran conservative minister, seen as Germany's second most powerful politician after Chancellor Angela Merkel, dismissed criticisms in the U.S. that Berlin's response to the Ukraine conflict is hostage to German business interests as "wrong, plain and simple." Ms. Merkel has said Germany would support broad economic sanctions if Russia undermined Ukraine's elections. She and Mr. Schäuble didn't specify what those sanctions could be. Germany has condemned Russian actions in Ukraine, including its annexation of Crimea, but has been reluctant to adopt costly economic measures against Moscow. Corporate Germany has lobbied vigorously against a disruption of the country's trade, investment and energy links with Russia. Mr. Schäuble said German business accepts that international stability comes before commerce. The 71-year-old finance chief is best known abroad for spearheading Germany's response in the euro-zone crisis and promoting painful budget cuts and unpopular economic overhauls in crisis-stricken countries after he took over as finance minister in 2009. He is also one of the elder statesmen of Germany's political establishment, which is wrestling with how to respond to a German public scared of a confrontation with Russia and increasingly skeptical of the U.S. The Ukraine crisis is highlighting Germany's growing pains as it becomes a leader in geopolitics, Mr. Schäuble admitted. He called on the U.S. to work harder to win public trust in Europe. "We, of course, need to make clear that we are part of the West," Mr. Schäuble said, in response to signs that many Germans don't fully support their country's Western alliance. "But we'll be even more successful if the United States understands that it is also part of the West." He said he reacted "with concern" to a poll that shows that a plurality of Germans—49% to 45%—want their country to play a "middle role" between Russia and the West, rather than standing firmly in the Western camp. Mr. Schäuble said the poll showed that his government needed to work harder to convince Germans that firmly opposing Russia's actions in Ukraine was the right course of action. But he said it also reflected waning U.S. influence here, something that had to do with Washington's reluctance to ratify and uphold international agreements in areas including finance. He blamed the U.S. Congress for frustrating reform of the International Monetary Fund, for example. "Perhaps now more of those in power in the United States will ask themselves: Why is America's soft power, even though it is the indispensable nation, not so great as to be understood by the dumb Germans?" Mr. Schäuble said. He said Moscow's short-term tactical victories in Ukraine would backfire in the medium term, because it needs "partnership with Europe" to develop its economy, which he said is overly dependent on oil-and-gas exports and "much less diversified than it was in Soviet times." Of Russian President Vladimir Putin's gas deal with China announced this past week, he said: "Congratulations, but the prices are well below those he can get in Europe." Germany's weight in European affairs means that Ms. Merkel's government is able to shape how strongly, or not, Europe puts pressure on Moscow to refrain from destabilizing Ukraine. Critics of German foreign policy, including some in the U.S. Senate, say Berlin hasn't been tough enough, signaling to Mr. Putin that he needn't fear serious consequences from Russia's most important European trading partner. But in Germany, Ms. Merkel's government is under fire from the opposite direction. Across the political spectrum, Germans steeped in the country's pacifist postwar culture say Berlin is being too confrontational and risking conflict with Germany's World War II adversary. Mr. Schäuble noted that many Germans would rather their country stay out of international disputes. Asked whether Germany was ready for the more prominent role in global affairs that many international leaders have called for, Mr. Schäuble responded, "Half and half." Mr. Schäuble's comments show how German leaders are trying to nudge the public into supporting a more involved foreign policy. German economic power has caused resentment in the euro zone, where many people blame Berlin for imposing budget austerity and the dismantling of some of Europe's cherished social protections as the solution to the euro-zone crisis. Public disillusionment with the European Union, and with mainstream politicians who have supported painful economic policies during the region's long economic downturn, is contributing to large protest votes for anti-EU parties in this weekend's elections to the European Parliament, pollsters say. "Some will interpret it that way," Mr. Schäuble said. "I think that's wrong. You can see that our policy to stabilize the euro zone was successful." 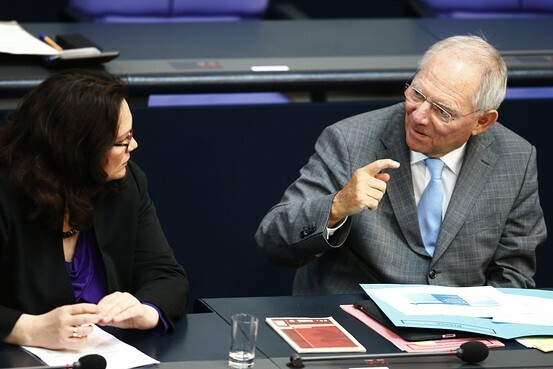 Euro-zone unemployment of nearly 12%, which is falling slowly thanks to the bloc's uneven recovery, shouldn't be blamed on German-backed austerity policies, Mr. Schäuble said. "The unemployment that we have in all advanced countries, not just in the euro zone, has to do with the dramatic transformation of labor markets through technology" and the "globalization of the supply of labor in ever more sectors," he said. "Are the approval ratings in the U.S. triumphal?" Mr. Schäuble asked, suggesting that popular dismay with the political establishment isn't unique to the EU. "When people have the feeling they're actually doing quite OK, democratic public opinion keeps a critical distance from the decision makers," he said. "Maybe it's not such a bad thing." «В случае вторжения Белоруссии на территорию Украины, 6-й флот США будет немедленно переброшен к берегам Белоруссии» — об этом заявила спикер Гос. департамента США Джен Псаки. она не виновата, что родилась в америке и училась с американской школе. Белоруссии стоит построит парочку дополнительных психиатрических институтов. Будем надеятся, врачи скоро будут востребованы. Почему бы не пообещать то ,что никогда не придётся выполнять ? Я, так понимаю, к Черноморским уже берегам Белоруссии. Застрянет посреди украины. Как и подлодка.